I love seeing plants send out roots and shoots. 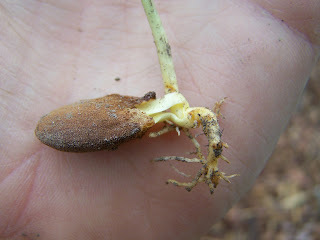 Yesterday I was planting some more beans and pulling a few weeds out of the bean bed; I found this little one and only noticed what it was after I had ripped it out. It looks like a peach tree to me. I called the boys over to show them and instead of admiring its beauty, they asked me why I didn't plant it. 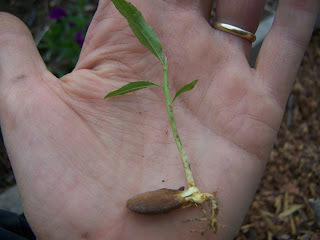 I like the way the inside bit of the peach pit looks so much like an almond. Anyway, W took it off somewhere and planted it. They come by this honestly as they know that I have such a hard time tossing baby plants in the compost bin. Then when I was planting more cukes I found this. We often have walnut trees springing up and I have no problem ripping them out, but this year, when I actually wanted a walnut tree for a friend, I have had a hard time finding any (I think it is because our dog has done such a good job of eating all the one we didn't pick up). I tucked this one into a pot just in case someone wants it. okay, this is just tooooooooo weird! i pulled a shoot out that looks EXACTLY like that today! i thought it WAS an almond!! i replanted it immediately into a pot. i've never seen anything like it, and here you and i find the same thing so close together? thank you so much for digging up the walnut tree for me. i'm babying it down by the pond. 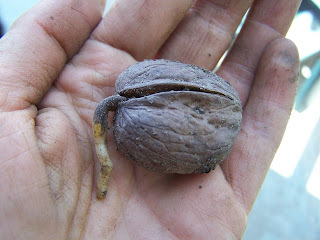 SO excited to have a walnut tree!! fun to see this one sprouting too!